The Bone People is so many things I almost don't have words to explain it. Startling, almost fragmented prose weaves together the story of three fractured souls; each character isolated, yet increasingly bound to the others, like the islands of Hulme's native New Zealand. It's no wonder this sprawling, beautiful novel won Hulme the Booker prize. In a tower on the New Zealand sea lives Kerewin Holmes, part Maori, part European, an artist estranged from her art, a woman in exile from her family. One night her solitude is disrupted by a visitora speechless, mercurial boy named Simon, who tries to steal from her and then repays her with his most precious possession. As Kerewin succumbs to Simon's feral charm, she also falls under the spell of his Maori foster father Joe, who rescued the boy from a shipwreck and now treats him with an unsettling mixture of tenderness and brutality. Out of this unorthodox trinity Keri Hulme has created what is at once a mystery, a love story, and an ambitious exploration of the zone where Maori and European New Zealand meet, clash, and sometimes merge. Keri Hulme, a Maori, grew up in Christchurch and Moeraki, New Zealand. She writes, paints, and whitebaits in Okarito, Westland. 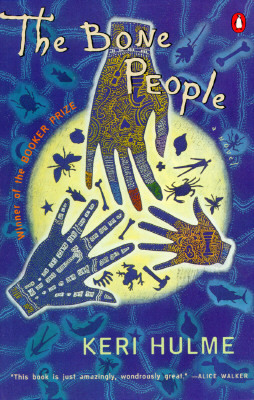 Hulme has written poems and short stories; The Bone People, originally published by Spiral, a New Zealand feminist collective, is her first novel. She has also written Te Zaihau: The Windeater. "This book is just amazingly, wondrously great." "An original, overwhelming, near-great work of literature"